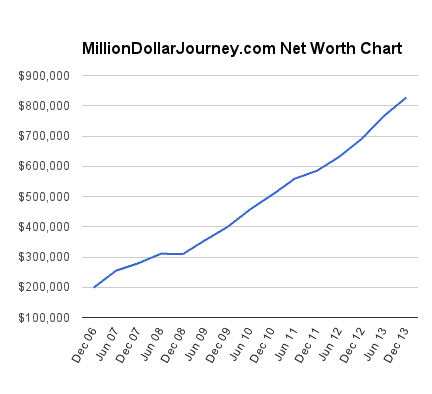 Welcome to the Million Dollar Journey January 2014 Net Worth Update – first update of the year. For those of you new to Million Dollar Journey, a monthly net worth update is typically posted near the end of the month (or beginning of the next) to track the progress of my journey to one million in net worth, hopefully by the time I’m 35 years old (end of 2014 – yes this year!). If you would like to follow my journey, you can get my updates sent directly to your email, via twitter (where I have been more active lately) and/or you can sign up for the Money Tips Newsletter. The beginning of a new year means registered investment accounts get new contribution room. In the first week of January, we deposited $11,000 into our TFSAs ($5,500 each) and $5,000 into the TD e-Series RESP accounts ($2,500 for each child). We paid for the contributions through a combination of our monthly savings, cash from our non-registered account, and a dividend distribution from our corporate account. With the stock market taking a breather after the monstrous gains in 2013, I’m hoping to put the new cash to good use. The S&P500 (via SPY), which returned almost 30% in 2013, retreated -3.2% in January. The MSCI EAFE (international via XIN.TO)) index followed with a -4% loss. The TSX (via XIU.TO) outperformed the rest with a small 0.4% gain. How did these returns affect my portfolio? Fortunately, my portfolios held up relatively well with my RRSP returning +0.86% (mostly US stocks and international) and my leveraged Canadian dividend portfolio gained 6.18%. Mind you, not all of the 6.18% is organic as I transferred another $5k from the HELOC into the non-registered investment account. In the big picture, for the January 2014 update we are up 3.04% for the month (and year thus far). We are up to $965k in assets and $852k in net worth with about 11 months left in the Million Dollar Journey deadline! With the deadline looming, there is about $150k left to go until the big $1,000,000 financial milestone! Hmmm, adjusting the home price by 3% for annual inflation. According to statistics Canada inflation was only 1.2% in 2013. Just trying to keep you honest :). @Greg, ha, good eye. 3% is still conservative, my tax assessment is $350k with market value probably closer to $450k. So given the short timeline left until the end of 2014, what do you predict your networth will be at by the end of the year? At the very least you should have an idea on contributions for the year. Nice job FT. Do you have a yearly % increase each year that you aim for? @Tim, good question! If Mr. Market is feeling friendly this year, then I predict that my net worth will be in the mid-high 900’s. If not, then who knows! Have been reading your blog for years and every one of the Net Worth Updates. Something I just noticed is that you do not include a “Tax Owed on RRSP” line on the liabilities. Should this not have been included? A portion of the money in the RRSP really belongs to the government and they are just nice enough to loan it to you until you take it out of the RRSP. Wouldn’t a liability of say 20% of the RRSP value be more accurate to give a true net worth? Stop being a party pooper. FT has made a clear plan where the RRSP withdrawls will be slow and steady where he can be in the 0% tax bracket…. Mmmm, is there such thing as a 0% tax bracket? Say if your net yearly income is 15k from RRSP withdrawls only? @Jared, yes this has been mentioned by a number of readers. I aim to have a revamped net worth update at the end of February. As Emilio mentioned, we will likely draw down on our RRSPs while our income is low resulting in very little tax payable. Similar to what we do now with our corporate accounts. I understand that the intention would certainly be to draw down when income is lowest, but getting to the 0% tax bracket seems unlikely considering your current net worth. While little tax may be achievable, the total is still more than a car loan when looking at the size of the RRSP. In all other areas (house value for example) you are conservative in your estimates, so just struck me when I realized it wasn’t there. I use 25% as our liability but our RRSPs are a much higher proportion of our assets even though the total asset value is comparable to yours. Good points. It’s not only RRSP, there is a tax liability with non-registered accounts, and defined benefit pension as well. However, since I only count the contributions of the DBP, there is no tax liability in this case. I hope to have these changes in my next update. A good way to account for tax on unrealized capital gains is to assume 25% of the gain will be lost to tax. This assumes your marginal tax rate on the gain would be 50%. Most likely, your probably looking at something more like 20%. Depending on the composition of your estate, the 25% could be the case on your terminal return. If you incur capital losses, that may provide you the opportunity to crystallize gains as you go along with no immediate tax owing. @Jared: capital gains are only taxed at half the rate for regular employment income. The top tax rate for capital gains is only about 25%. @Dan, no plans to include the theoretical value of the business. However, in coming updates, I will be including invested corporate cash. Yeah, I was using 20% in my calculations (40% * 50% = 20%). As I said that still seemed high as it isn’t likely I would sell all of it in my lifetime. I’m thinking that I will probably use 10% of the Capital Gains as the liability in my calculations going forward. What do you hold in your Smith Manoeuvre Investment Account that you find risk worthy ? Would you consider investing in dividend and REIT ETF applicable for your strategy? been following your blog for years. The investment you are doing from HELOC, have you maximized your HELOC ? I’ve been reading for years and I thoroughly enjoy your site. Thank you. As a big fan of good debt and leveraged investing, I don’t wholeheartedly agree with more debt being higher risk. Sometimes, I even think that not taking on more good debt is actually a higher risk, at least for some people. For someone like you, for example, you are great at investing. And earning prime rate + 2% returns on investment is attainable with today’s rate. And for you, probably attainable even if prime goes up a few % in the next few years. So let’s say you maxed out your Smith Manoeuvre account and always only had 20% equity in your house, got the largest margin loan accounts you could get, got the largest RRSP loans you could get and then got the largest unsecured line of credit you could get. Maybe not all in one day but get one of those and then invest and when there’s no money left, take on the next one until there’s none left. I don’t mean that everyone should do this strategy. But I mean specifically for FT. He posts month after month about attaining great returns. I hardly think if he had more money to invest, he would all of a sudden be bad at investing. I haven’t really thought about how much new money to invest that would be. But let’s just say it’s $250,000. Do you, FT, and readers really think that if FT had $250,000 more to invest but had to pay $1000/month more in debt servicing, that he could not handle the extra “risk”? Or do you think that after a few months of adjusting, he’d just be a richer person? The only potential down side I can see is that FT might have to eventually trade cash flow for net worth increases. What if interest rates are 7% in a few years and his dividend distributions are only 5%. Then he’s trading 2% extra cash flow expense for the market value increases. That’s not always appealing. Let’s say he has $250,000 invested for $1,000/month (about 5%) debt. If he made 3% from dividends annually and his market value increases 5%, he’d be up 3% total. He’d be up $7,500/year. And that doesn’t include the investment loan tax deductions. So maybe around $10,000/year extra. Isn’t this an easy (not for everyone but for FT) way to become richer, faster? Getting rich is about spending less than you earn and growing your assets faster than your liabilities. Just because you have the extra complication and risk of liabilities, someone like FT could still grow his assets faster than those now higher risk liabilities. 1) Which is riskier, FT taking on $250,000 of low interest debt or FT not taking on $250,000 more debt? 2) Under which scenario do you think FT would have a higher net worth? @Irwin, the HELOC maximum is a little over $200k, so no we have not reached the maximum. In terms of setting a limit on a HELOC, some banks allow HELOC “sub accounts”, so you could setup a sub account with a particular limit. For me, I would consider leveraging up to the maximum if there was a significant buying opportunity (ie. 2008), but realistically, I would sooner pay down the loan with cash, and reborrow to invest to keep the balance at a reasonable level. @R, great comment and you bring out a good point that leverage can certainly amplify returns but as you mentioned, it’s about risk management – particularly risk tolerance. As the markets are known to increase over the long term, leveraging a lot now could result in a higher net worth providing that a sound investment plan is followed. The problem is that most investors don’t follow a system and buy/sell based on emotion (on occasion myself included), which will result in losing money. Considering the market of the last five years it might be a case of rising waters lifting all boats. What’s the old saying, don’t confuse a bull market with genius? (No offense, FT) Look at Victor Niederhoffer, for example. Apart from that, I would guess that investing/trading is not what life is about for FT; it is a means to an end. Taking on added risk may also mean assuming additional stress which could negatively affect other functions of FT’s life, probably something he is not willing to do. We have not had a correction in a while. Its been over 500 trading days without a 20%+ correction. I would wait before leveraging more, if at all. It may go up for another 10 years…. but more likely to correct within the next few years. And the longer it takes for that to happen, the bigger that correction will be. Jared, why 10% cap gains tax if you are not planning to sell at all? I would think inflation would be a bigger threat to your capital over a long retirement period (30 to 50 years). Perhaps discounting your expected increase in dividend payment by and an historical inflation rate… same with your expect capital gains minus historical inflation… they may project deflation over the next 5 years (since babyboomers spend less) but eventually it will pick up and may bite us, early 80’s style – which may balances out to historical average anyway. Agreed, you really need to take a look at your risk tolerance before taking the leap into leveraging. The question to ask is what you did during the 2008 correction? Did you panic and sell? Did you just hold and ride out the storm? Or did you back up the truck? If you panicked, then leveraging is likely not a good idea. Also note that I started my SM portfolio the summer of 2008, at the height of the market just before the crash, so I know first hand what a real correction can do to a portfolio. I clearly don’t understand why leveraged investing is so much different than investing with cash. Can someone please explain it to me? If the market has a 20% correction. Aren’t your non-leveraged investments down too? FT’s net worth went up around $135,000 last year. If he had $12,000 more expense because of debt servicing last year, then if his leveraged investments somehow performed way worse than any of his previous investments the past several years and he made $0 from them, he’d have made $123,000 or maybe a little less in case that other $12,000 would have made some money. Let’s say he would have made $120,000. That hardly sounds like doomsday to me. If the day after he invests his new $250,000, the market goes down 20%. Even still, that hardly sounds like doomsday to me either. The $250,000 is extra money, it’s not like it’s money that he needs to pay the mortgage or buy food for his children. It’s just part of the pool of money that’s for long term investment. And just like the rest of his other invested money, over time it will increase in value again. I feel like leveraged investing just amplifies what you already do. A good investor or lucky person makes more money. A bad investor or unlucky person loses more money. It’s just a higher amount of money and a bit of a cash flow strain as a trade off for higher net worth. So only recommended to people who have enough reliable income to take on more cash flow strains. So what if your bank called you up and said that they have a promotional $1,000,000 line of credit at a rate of 7% interest available for you to use to invest? All of you would decline because it’s too risky? It reminds of Ed Rempel’s “How come I’m not rich”. I feel like rich people would take that offer and middle class people would run away screaming. Virtually every public company has massive debt, with the larger ones having debt in the billions. And you feel comfortable buying their stocks. But investing a few $100,000s with the lowest interests rates in years, the same way you’re already investing the rest of your money is somehow too risky. It’s only risky in my mind if you’re already investing the rest of your money badly, don’t add any more funds to be badly invested. Please enlighten me. I’m very confused. ALL the Private Equity deals (4) I’ve entered into since 2009 have zero or near-zero debt and have all bested broad market returns. If you hold public companies as you mention, you are most likely not being rewarded for the ever-increasing risk (debt load) they are assuming. Just because people buy stocks doesn’t mean they want to or think it’s the best idea, they might just be unaware of other investment choices or think they have to. For one, a rich person would already have the assets to back that LOC and if things went sideways they could cover themselves. Or perhaps a rich person would think 7% a ridiculous rate and most likely have the pull to broker a much better deal. In addition, a good investor looks forward. Perhaps FT sees both market corrections and higher interest rates on the horizon (as well as life events), thus deploying more cash now into the market via debt would be a bad idea. how do you manage tax effectiveness in your non registered accounts? @John, i’m the buy and forever hold investor, so capital gains tax isn’t an issue. I do receive eligible dividends though, which get preferential tax treatment. Congrats….so you accumulated $25k in excess of consumption in a single month. Do you ever feel like you have too much? Not judging you….just curious is all. $1 million by age 35, that is amazing. Thanks for taking the time to post all of this. I find it very encouraging and helpful to see others numbers. So, thanks for being open and honest about your money. My wife and I started posting our numbers. It is good to see other posting number too, makes us feel not so freakish.